Because there’s no cure for the chronic condition, patients living with Crohn’s disease and ulcerative colitis — the two most common types of inflammatory bowel disease (IBD) — often rely on anti-inflammatory or immunosuppressive drugs and careful diet planning to manage their symptoms, said Dr. Matam Vijay-Kumar, the senior author on the study and director of the UT Microbiome Consortium and associate professor in the UT Department of Physiology and Pharmacology. 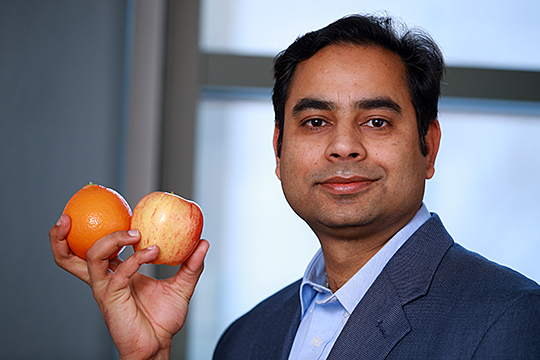 Research conducted by Dr. Vishal Singh suggests foods high in the dietary fiber pectin, found in apples and extractable from orange peels, may help individuals with inflammatory bowel disease. But even that can seem like guesswork. “IBD can be a debilitating condition and its prevalence is on the rise. For IBD patients, there has been a puzzling question of why they report poor tolerance to certain types of dietary fibers,” said Dr. Vishal Singh, a Crohn’s and Colitis Foundation Fellow mentored by Vijay-Kumar at UT. In a study published last month in the gastroenterology journal Gut, a team of UT researchers demonstrated a diet rich in pectin or pectin-derived fibers may be a better alternative to the prevailing dietary fiber guidelines aimed at helping patients improve their IBD symptoms. The study also confirmed that inulin and inulin-like fiber exacerbated colitis in lab mice. Inulin and pectin are two of the most common refined fibers added to processed foods as a way to add texture and boost their health appeal. Both are indigestible soluble fibers, Vijay-Kumar said, but they require different bacterial enzymes to be broken down in the gut into short-chain fatty acids. Singh and his fellow researchers said the finding could assist patients in developing a better diet for managing or preventing flare-ups. The study was supported by the Crohn’s and Colitis Foundation, and the National Cancer Institute of the National Institutes of Health. In the study, researchers examined the role played by bacteria that naturally reside in the gut. They demonstrated that inulin promoted accelerated growth of one particular harmful bacterial strain, while pectin did not. They also found that a brief period of fasting may boost the body’s production of a physiological inflammation inhibitor that can protect against the inflammatory reaction caused by the gut bacteria processing inulin. Pectin is found naturally in a variety of foods, including apples. It also can be derived from other natural sources, such as orange peels, and used as a food additive. Though the study looked only at pectin and inulin, the team hopes to conduct similar studies on a wide variety of dietary fibers present in processed foods with the goal of learning more about how different types of fiber cause or reduce colonic inflammation. This entry was posted on Tuesday, February 12th, 2019 at 3:11 am and is filed under Medicine and Life Sciences, News, Research, UToday .